The Sennheiser Momentum 2.0 is the 2nd generation of the range bringing enhanced comfort, folding ear pads and Active Noise Cancellation. Combining the wireless freedom that you crave with Sennheisers signature Momentum sound, these headphones deliver a peak performance. Exclusive materials such as stainless steel and real leather luxuriously finish off the overall appearance of the Momentum 2.0. The closed-back design of the headphones help to create a truer sound-scape while cutting down on background noise and sound leak. 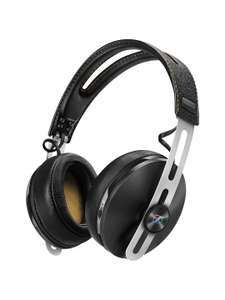 Better still, the Sennheiser Momentum 2.0 also features Active Noise Cancellation so even the ultimate of inconveniences does not disturb your music listening. If my Sony MK3's did not have so many gadgets on them, I would still be using my SM2.0's everyday, had mine about 4 years now and never had one issue with them, hate to say it, but I prefer the sound of these, to my old Bose Quiet Comfort 35 ll's, brilliant price at less than £200 quid, so just buy them! If my Sony MK3's did not have so many gadgets on them, I would still be …If my Sony MK3's did not have so many gadgets on them, I would still be using my SM2.0's everyday, had mine about 4 years now and never had one issue with them, hate to say it, but I prefer the sound of these, to my old Bose Quiet Comfort 35 ll's, brilliant price at less than £200 quid, so just buy them! How is sound quality vs sony? I suppose NC is miles ahead on sony. How is sound quality vs sony?I suppose NC is miles ahead on sony. The mid's on the sony's are spectacular, the SM2.0's are not that far behind, its the higher frequency bass, where the sony takes over and shines, yes the noise cancellation is not as good, but tbh, when you are listening to hi-res 192+ audio or flac files, on either, they are both naturally good! They are both worth the money and with the sonys getting close to sub £240 on eglobal again, it would be a tough choice if i could only have either or!!! As @Lower_for_Longer has already said it, tidal mqa is just stunning on them! I have them, brilliant headset, my son has the Bose quiet comfort 35 both very similar although I think the Bose look better. ‌ The mid's on the sony's are spectacular, the SM2.0's are not that far …‌ The mid's on the sony's are spectacular, the SM2.0's are not that far behind, its the higher frequency bass, where the sony takes over and shines, yes the noise cancellation is not as good, but tbh, when you are listening to hi-res 192+ audio or flac files, on either, they are both naturally good!They are both worth the money and with the sonys getting close to sub £240 on eglobal again, it would be a tough choice if i could only have either or!! !As @Lower_for_Longer has already said it, tidal mqa is just stunning on them! I have sm2 and very happy with sq, nc is fine. I am annoyed with design though... And find headband little bit painful after some time. But is that in wired mode? NC is not good on these however I prefer the sounds quality of these than my Sony xm3. Also I prefer the comfort of these than the Sony's. Very tempted, but only because my Bose QC25s leak a fair bit of sound (outwards). However, I've never found anything quite so comfortable to wear for long periods as the QC25s. But like myself I suspect that most people will be using these headphones wirelessly. But like myself I suspect that most people will be using these headphones …But like myself I suspect that most people will be using these headphones wirelessly. I have sm2 and very happy with sq, nc is fine.I am annoyed with design …I have sm2 and very happy with sq, nc is fine.I am annoyed with design though... And find headband little bit painful after some time. Easy fix! I find them waay too tight. In the metal headband I slowly worked along flexing it quite hard to straighten it slightly. Worked a treat and perfect fit now. Best method I found was lots of little adjustments, done want to go too far! NC is not good on these however I prefer the sounds quality of these than …NC is not good on these however I prefer the sounds quality of these than my Sony xm3. Also I prefer the comfort of these than the Sony's.